Check here to find out where "Sweet Dreams UVA" events are around Virginia and to keep up on the latest news! March 2014: Author Kendall Wolfson joins the Schilling Show to discuss the book writing process and the inspiration behind the book. Listen to the segment below! Fall 2013: The Law School at the University of Virginia's Magazine, UVA Lawyer, includes the publication of "Sweet Dreams UVA" in the In-Print section of the Fall 2013. The full In-Print section is available online. UVA Football Game Day 2013 Book Signing: Saturday September 21st! 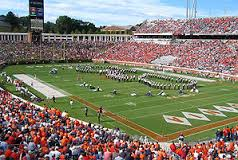 September 21, 2013: Join the author for a book signing of "Sweet Dreams UVA" at TJ's Locker, directly across from Scott Stadium in the Aquatics and Fitness Center (AFC) on UVA Football Game Day! Festivities take place from 12:30-3:00 p.m. before the UVA vs. VMI game as a part of the Cavalier Fan Fest. Join us for inflatable games, face painting and the UVA photo booth! 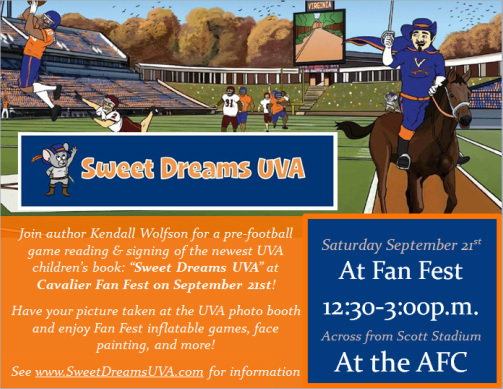 July 2, 2013: Mascot Books announces the release of Sweet Dreams UVA, written by Kendall Wolfson and published through the Mascot Books Author Program. Sweet Dreams UVA will endear Hoos of all ages to the beloved University of Virginia and acquaint them with the school’s rich traditions and culture. Visit Educator Resources for free lesson plans for little Hoos in Pre-K to 2nd grade to accompany reading the book in your classroom!